2001 - 2014 Ford E Series Van Grip Step Aluminum cab steps. Perfect for work trucks and commercial applications. Each set includes one 36 inch step for driver side and one 98 inch step for passenger side. Mounting brackets and instructions included. Steps have innovative all weather grip surface. 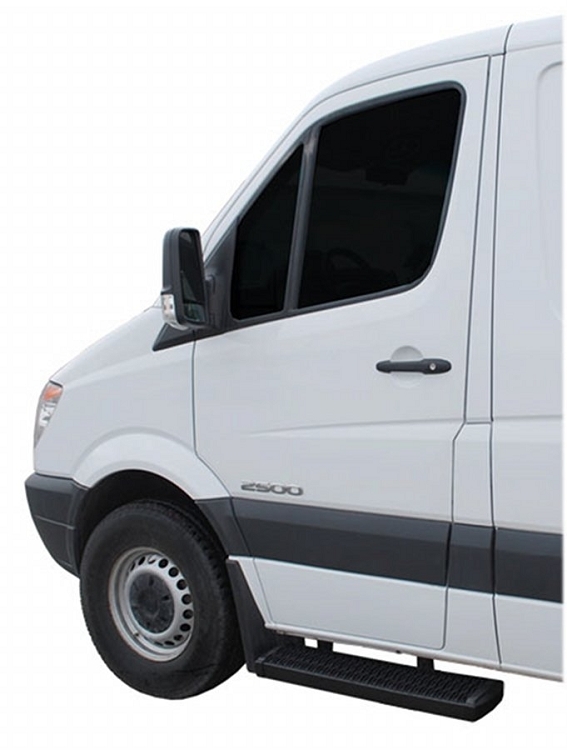 2001 - 2014 Ford E Series Van - all models. Drilling may be required. Stop messing around and start getting the job done with LUVERNE Grip Step™ 7" running boards. These roughneck boards feature a unique, expanded metal tread for superior traction in any type of weather, and a 7" x 2 1/2" rectangular design to offer reliable footing without any of the nonsense. They are built from a 5052-H32 aluminum alloy, making them exceptionally strong and putting rust in its place. Grip Steps™ are also simple to install, using high-strength vehicle-specific brackets and stainless steel fasteners for a no-drill, custom fit. As always, they are made right here in the USA for quality you can trust and footing you that won''t let you down. NOTE: The mounting brackets for these running boards are included but shipped separately. Made in USA, usually ships within 7 days. Please allow an additional 1 - 5 business days for delivery to most US locations. Ships only by Fedex Ground or Home Delivery.